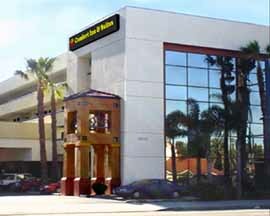 Comfort Inn and Suites LAX Airport is an ideal airport hotel located nearby Los Angeles International Airport. A 24 hour shuttle takes passengers to and from the terminals and Los Angeles’ famous downtown attractions are a short journey away by car or public transport. Quality shopping is available at the nearby Westfield Fox Hills and South Bay Galleria shopping centers and world class beaches are a short drive away too. The hotel can arrange sightseeing tours to any tourist destination and all guests can access free high-speed internet access in their rooms. The hotel also has an outdoor pool, a business center and the usual set of amenities in rooms. Restaurants next to the Comfort Inn and Suites include Little Caesars Pizza, Panda Express and El Pollo Loco. Complimentary breakfast and coffee is served daily at the hotel. Comfort Inn and Suites LAX Airport offers free coffee and a complimentary newspaper to all guests. The hotel has outdoor parking available for drivers and an outdoor pool and tour desk that can arrange sightseeing tours around LA and California. Business guests can use copy and fax machines and there is also a laundry service and valet cleaning service. The Comfort Inn and Suites’ rooms have cable TV, high-speed internet, air-conditioning, microwave and refrigerator. Some rooms have an in-bath whirlpool. There are meeting rooms on-site that can be hired for meetings and events. They are of different sizes and types making Comfort Inn and Suites a flexible business meeting location. California’s renowned beaches, such as Venice, Manhattan and Marina Del Rey, are within 5 miles of the hotel and the Fox Hill and Bridge Malls are even closer, for those eager to go shopping. Nearby corporate offices include Xerox and Herbalife, as well as the Air Cargo companies’ offices and the Hughes Building. A courtesy shuttle is available around the clock to take guests to and from LAX International Airport. Taxis can take guests to the AMTRAK station which is about 6 miles away.